There are many many stories from Tutbury Castle in Derbyshire, England about hauntings. There have been numerous television shows done and you can find loads of information online about the “encounters” that people have experienced. However, even though the place absolutely has the history to be a great place for ghosts to hang out, but is this a case of mass hysteria and a bit of publicity to bring the visitors in to visit? Some say that there are “lay lines” beneath the castle that cause strange energy in the castle and affect what people see and feel. It doesn’t hurt either that the curator, Leslie Smith, is now on the British television program “Most Haunted” as the historian. She’s got a gift for spinning a spooky story as well. 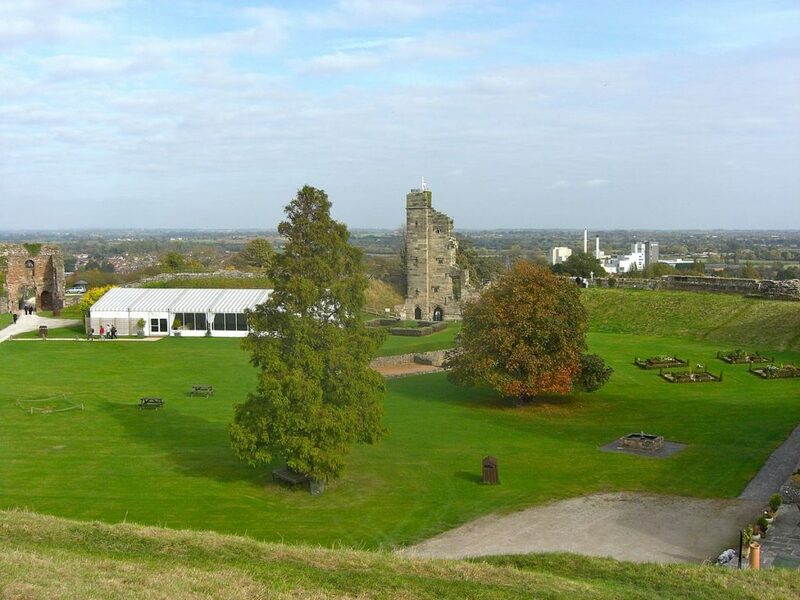 A recent program which aired in England on Bravo on 24th of August was about Tutbury Castle. It was called “The Worlds Largest Ghost Hunt” had hundreds of ghost hunters converging on the castle for an ambitious record-breaking TV event. The show followed the participants of the ghost hunt from dusk till dawn as they searched for spectres and phantoms. People were eager to see something, anything, so early in the evening people were already saying that they’d seen outlines and felt “a strange presence”. This was helped along by historically dressed actors inside the castle and on the grounds. Leslie Smith dresses as Mary, Queen of Scots and talks about how she focuses on her to try to bring her ghost to the castle. Mary was the castle’s most famous prisoner. Through the night people have interesting experiences such as one man receiving scratches on his neck, feeling presences, tingling sensations, dizziness, “feeling sick”, feeling cold, or feeling phantom touches on their bodies. One lady feels a little girl pulling on her fingers although no one is there. She breaks down in tears with emotion. Another lady sees a hand come at her through a turret window but nothing is captured on film. Several people spend the night in the dungeon in the North Tower and catch an orb on film. The stairwell is a hot spot in the castle. Mary, Queen of Scots dominates the scene on the stairwell as Smith re-enacts a speech given by her. They show film of orbs and lights that have appeared around Smith as she performs as Mary. Many other people feel unsettling presences and emotions on the staircase as well. This is the room where the man received the scratches to his neck, just at the bottom of the staircase. Smith thinks that a male spirit “picked a fight” with the six foot six bouncer from Derby and asked him to leave the room so nothing worse would happen to him. A recording of the incident shows him ducking away from the attack and nothing behind him or on the stairs. In the interview with him, you can clearly see the fresh scratches and that blood has been drawn. The King’s Bedroom, or King’s Chamber, also seems to be a hot spot where people have claimed to be harassed by spirits. Some have said they are “overwhelmed” by spirits and many say they feel sick or dizzy while inside the room. Our bouncer from Derby felt someone or something hit him on the back of the head and became so distraught that he wanted to stop filming and leave the room. Are these experiences real or are they happening because the subjects really want something to happen to them? Could the dizziness and coldness come from an increase in adrenaline production in the body and heightened senses due to the excitement of the evening? Most of the experiences probably are due to heightened sensations, but then some, like the scratches and orbs of light are a bit harder to explain. The whole idea of paranormal is interesting to us because it is unexplainable. We may never know the truth, but we sure have a fun, scary time trying to find out.